Η βίλα βρίσκεται στο παραδοσιακό ήσυχο χωριό Εμπορειό στο νότιο τμήμα της όμορφης Σαντορίνης και βρίσκεται κοντά στο κάστρο του χωριού. Το ακίνητο βρίσκεται σε ένα παραδοσιακό κυκλαδίτικο στιλ, με όμορφη ηλιόλουστη βεράντα και ιδιωτική πισίνα. Έχει δύο υπνοδωμάτια, δύο μπάνια, σαλόνι, πλήρως εξοπλισμένη κουζίνα με όλες τις ηλεκτρικές συσκευές συν δύο επιπλέον δωμάτια σπηλιά. Περιλαμβάνει όλα τα κλινοσκεπάσματα και πετσέτες, τηλεόραση πλάσμα, DVD, WiFi, πλυντήριο ρούχων κ.λπ. Η βίλα μπορεί να φιλοξενήσει 6-8 άτομα. The villa was lovely and clean, with a huge amount of character. It was fully equipped with all that we needed and we had a very supportive representative to help with any questions. 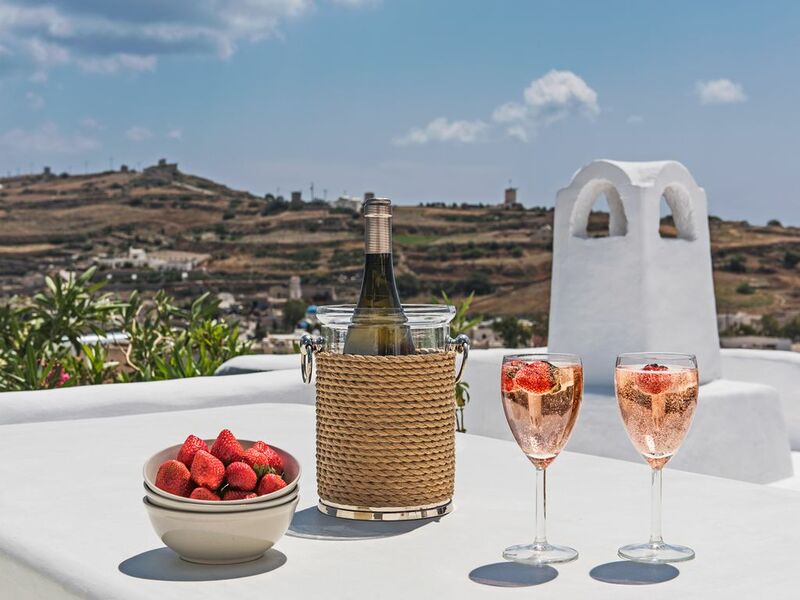 We would thoroughly recommend this property for an authentic taste of life in Santorini. This house was a good size for a family of 7 and very clean and comfortable. One double bed is in the basement and requires access via a ladder, but that didn't pose a problem. We really enjoyed the pool to cool off after sightseeing in the hot sun. And the rooftop view was great and perfect for sitting around in the morning or after the sunset. All very relaxing. Wifi, air conditioning and coffee machine worked well. Bathroom was equipped with shower gel, shampoo and hair dryer. Having the washer was handy. Really appreciated the daily garbage disposal service and pool cleaning. After experiencing the busy towns of Oia and Fira, we found Emporio to be the perfect quiet, central point to access everything in the bottom half of Santorini. All attractions were within a 20 minute drive. Recommend a rental car for sure. Lighthouse, white/red/black sand beaches, Pyrgos, wineries, brewery, various top restaurants are all close by. Anastasia, the villa manager, was very helpful with a variety of recommendations, which we followed and we were not disappointed with. Haris should correct the listing though. There was only one bathroom, not two. And be prepared to park and walk uphill/downhill on cobblestones to get to the property. But well worth it. Highly recommended. Schönes Haus in toller Lage. Emporio ist ein super Ort um Santurin zu bereisen. Man wohnt mittendrin, kleine verwinkelte Gassen, Treppen, Durchgänge. Zwei Cafés die man erst sieht wenn man davor steht, Kirchen und Befestigungsanlagen. All das klebt zusammen mit dem Haus am Hang von Emporio. Perissa und Perivolo sind wohl die schönsten Strände und gerade noch zu Fuß erreichbar, zu sehen sind sie von der Terrasse. Parkplatz 100 m entfernt. Nochmal: Emporio ist toll, anders als in unserem Reiseführer gibts jetzt auch mehr Restaurants und Supermärkte. Kein einziges Hotel, also alles noch auf einem 'normalen' Level. Dort wird gelebt, die Bewohner kaufen morgens ihren Fisch vom Pickup der Fischer runter und Sonntags ist Kirche. The house was beautiful...clean...perfect for family of five. Pool was great after long days of moving around the island. Roof top view was great for sunrise and evening relaxing. Emporio is a perfect jumping off point...close to the beach. Quiet town away from craziness of Fira, but only 15 minute drive away. Definitely rent a car. Pyrgos...town next door(5min by car) is beautiful with excellent restaurants. Check out Kamira beach, Parissa and Perivolos Beach only 10 minutes away. Anastasia, the house manager, was great. Very friendly and connected us to Barbarossa sailing which was an incredible evening and sunset cruise on the Caldera on a beautiful 52 food sailboat. 5 stars for the house and everything we did. I've been in Santorini for 8 days with other 6 people and this house was incredible! Everything it's clean, the pool it's big enough and so deep! In my opinion the most beautiful thing is the terrace, where you can enjoy a gorgeous view. All the rooms, the bathroom and the kitchen are confortable and well equipped. In the end, i have to say that the villa manager Anastasia is amazing! She was so polite and helpful with us!! Thanks for all! Das Haus ist wirklich ein Bijou und schön im alten Dorfkern integriert. Der dazugehörende private Pool ist das Highlight des Hauses. Das Wifi und die Klimaanlage im Haus sind einwandfrei. Die Terrasse über der Wohnung ist ebenfalls Traumhaft kann aber wegen fehlendem Schatten nur Abends benutzt werden(ein guter Sonnenschirm könnte dem Abhilfe schaffen). Die Betten sind bequem und man schläft gut darin. Der Vorplatz im Freien ist zum Frühstücken ideal. Am Nachmittag mangelt es auch hier an Schatten. Die Haus-Managerin Anastasia hielt sich dezent im Hintergrund, wenn sie aber gebraucht wurde war sie sofort mit ihrer freundlichen Art zur Stelle. Die Wohnung und der Pool wurden regelmässig geputzt und waren immer in einwandfreiem, einladendem Zustand. In der Küche und im Badezimmer fehlten uns die Möglichkeiten Tücher und Waschlappen aufzuhängen(wir hatten zum Glück selber eine Leine dabei). Fazit: Wir haben uns wunderbar erholt und würden bei einem Urlaub auf Santorini wieder dieses Haus wählen.